The second in a scintillating new series full of Art Deco ambience is a mystery set in the 1920’s. Young Iris Cooper visits the home of a fellow-student with a special interest in Egyptology–and an actual mummy in his home that soon contains a new dead body. 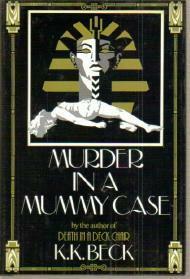 Today we continue with book two of the Iris Cooper series, Murder in a Mummy Case. Iris is in her first year a Standford when she agrees to spend the Easter holiday at the home of fellow co-ed, Clarence Brockhurst. He is a young egyptologist interested in courting Iris, but our young heroine gets more than she bargained for when she arrives to house full of eccentric characters only to find the body of a maid hidden in a mummy sarcophagus. What follows is a world wind investigation that takes Iris to China Town and dumps her in the world of the occult. I’m going to start by saying that this is my least favorite of the three Iris Cooper novels. The Brockhurst family were so frustrating. The male Brockhursts are tedious and boring; females are needy and naive. And they were the perfect stereotypical representation of an affluent family in the 1920s. However well written, it didn’t make Clarence and his obnoxious pursuit of Iris any easier to read! Thankfully, Iris was just as put off. And since I started with the negative today, I’ll continue by saying the archaeologist side of me wanted more information concerning the actual mummy, Clarence’s expedition, and why the mummy was being stored in the house! WHY?!? I need more! Murder in a Mummy Case is a great transitional story that develops our main characters in preparation for the final installment of the series, Peril Under the Palms. Murder in a Mummy Case will leave you laughing at the outrageous and on the edge of your seat in curiosity. It’s the perfect read to pull you through the work week! Have you picked up the Iris Cooper series yet? Let me know what you think!